This story was delivered to Business Insider Intelligence “Digital Media Briefing” subscribers hours before appearing on Business Insider. To be the first to know, please click here. As big media continues to develop direct-to-consumer (DTC) streaming services, companies will face massive and growing investment demands, according to two articles examining the SVOD strategies by Disney and WarnerMedia’s HBO. Breaking into streaming requires an enormous outlay of capital for talent and content.And that investment must be ongoing, to ensure a consistent stream of fresh content is rolled out to attract new subs, and retain existing ones. Digital subscriptions offer the promise of recurring revenue, but also enable consumers to churn out as easily as they sign up for services. Top talent. SVOD like Netflix and Amazon all pay talent upfront for their work, rather than splitting aftermarket sales, as is common under traditional media talent deals. Both Disney and HBO are each following suit paying talent upfront, which could squeeze profits in the near term, particularly amid heightened competition from tech giants. Netflix, Amazon, and Apple are each plowing their own billions into streaming video services, driving up upfront talent costs across the industry. Original content. HBO, whose own standalone SVOD HBO Now launched in 2015, expects to expand its content output to 150 hours of original content in 2019, up from the 100 hours it produced in 2018 on an annual budget of $1.5 billion in 2018, per Vanity Fair. That’s a far cry from Netflix’s estimated 1,000 hours of original content and estimated outlay of $13 billion in 2018, which is projected to reach $22.5 billion in annual spend by 2022, per Goldman Sachs. Meanwhile, Disney is estimated to spend about $500 million on original programming for the platform in 2019, per RBC Capital Markets. Much of that investment will go towards developing original films, with budgets ranging from $20 million to $60 million. While Disney is pouring “real money” into its new Marvel and Star Wars-branded productions, it’s likely to spend less by comparison than any of the tech giants. 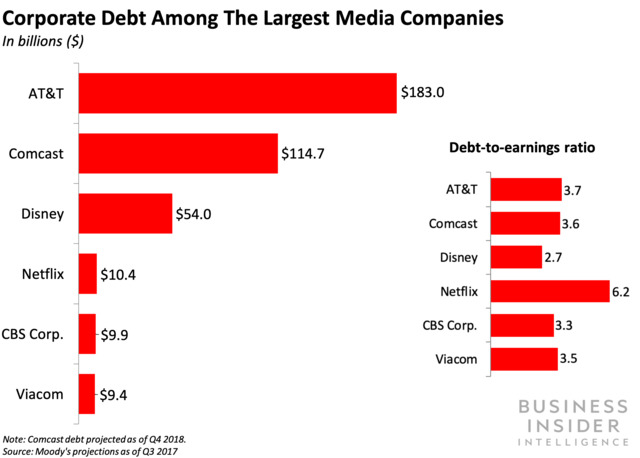 Debt could become an albatross looming over companies’ streaming efforts. 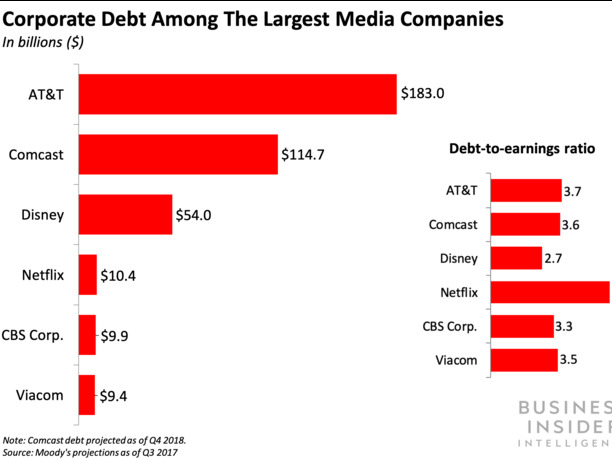 All big media companies are now facing enormous corporate debt loads in the aftermath of massive consolidation and restructuring efforts and as they continue to invest rising sums in new streaming operations. Disney’s streaming operations have already taken on considerable losses: Disney disclosed in an SEC filing earlier this month that its newly formed Direct-to-Consumer and International division had a losses of $738 million in operating income for the first nine months of 2018, on revenue of $3.4 billion, though most of that came from the international channels. Further, as traditional media supplies its own services with content, it’s pulling back on content previously licensed out to streaming giants — eliminating a channel of billions in pure profit that many had been using to prop up other fading parts of the business. The unforgiving and risky nature of debt will make it even more imperative for companies’ streaming offerings to succeed over the next few years, and it could be years before any platform starts to recoup its streaming investment. Disney and HBO will rely more on brand strength versus content volume to compete with deep-pocketed tech giants. We expect that Disney and HBO may have the strongest chances of survival in the age of DTC subscription streaming media, fueled by their strong, globally recognized brands, mass-market franchises, and reputation for high-quality content. Nevertheless, headwinds are hard to ignore, and signal the difficulty of successfully transitioning from traditional to SVOD distribution.